A team of researchers, including two from the University of Nebraska-Lincoln, have developed and proposed a new definition of drought that integrates ecological, climatic, hydrological, socioeconomic and cultural dimensions of drought. 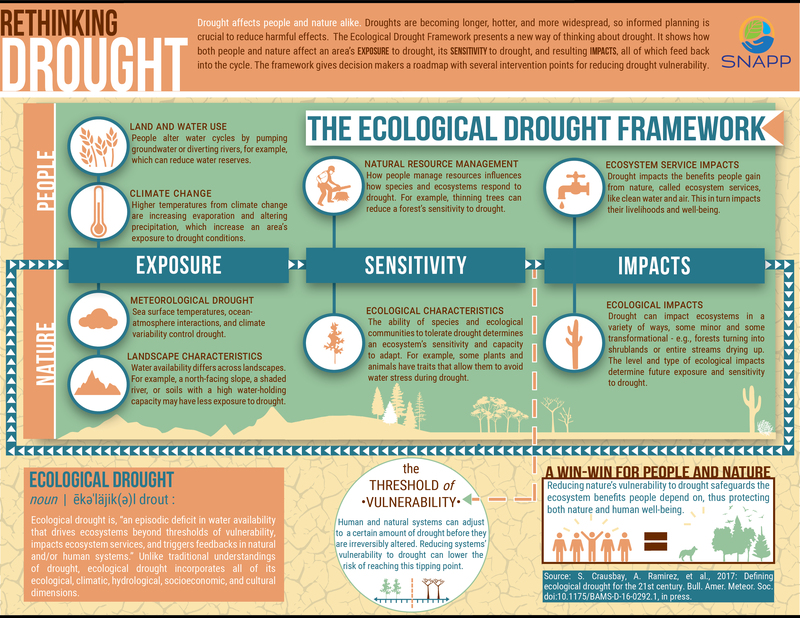 This novel approach to thinking about drought may help decision makers better prevent and respond to drought impacts. Up until now, definitions of drought have tended to focus primarily on drought’s effects through a human-centric lens — reduced streamflow and lowered reservoir and lake levels, crop stress and failure, and socioeconomic impacts. What these definitions ignore is the high cost of drought on nature and how that affects human communities as well. The new definition, which was presented in the Bulletin of the American Meteorological Society, describes ecological drought as a deficit in available water to the point that ecosystems are irreversibly altered, affecting benefits people typically gain from nature, such as food, water, clean air or recreation. The lack of benefits, in turn, triggers new reactions in both natural and human systems. When ecosystems change, the services they once provided may be altered or lost altogether — and replacing them can cost communities millions. After a decade-long drought, for example, Australia spent about $6.2 million to support air quality regulation, water treatment, erosion prevention and other services that previously had been provided by a river ecosystem. Those costs are likely to keep increasing. Over the course of the 21st century, the researchers said, droughts have grown hotter, longer and more expansive than those previously recorded. Human demands for water will exacerbate the issue, and combined with changes in human land-use practices, such as fire suppression, and with climate change, ecosystems will continue to become increasingly sensitive to drought. “We now see profound ecological responses to drought, like mass fish kills or widespread tree mortality in the western U.S., that have real consequences for biodiversity, including complete ecosystem transformations in some cases, for example, from forest to shrubland,” said Crausbay, currently a post-doctoral researcher with the National Center for Ecological Analysis and Synthesis at the University of California. Working group members Mike Hayes, professor within the School of Natural Resources, and Deborah Bathke, climatologist with the National Drought Mitigation Center, both at University of Nebraska-Lincoln, said the definition for ecological drought will be a benchmark in drought risk management and planning. It already is being utilized by planners in Montana to identify which ecosystem services, if lost, would matter the most to their communities, and how they can reduce the services vulnerability to drought. Going forward, the SNAPP working group hopes to continue integrating ecological drought into drought science, planning, policy and management, so communities can take a proactive approach to combat drought, rather than a reactive one. The drought expert working group is a collection of specialists from a variety of fields. They are climatologists; hydrologists; wildlife, fish and plant biologists; fire ecologists; science communicators; planners and policymakers; environmental economists; and social scientists dedicated to creating a framework to help communities better prepare for drought and adopt management strategies that support whole ecosystems. For more on the group, click here.